Golden peach color. Tropical, confected aromas of pineapple candy, candied coconut, fruit stripes gum, apricot, and dried pickled mango with a syrupy, racy, sweet-and-sour medium body and an interesting, medium-length sour tangerine candy, Creamsicle, and orgeat finish. A tropical getaway of a mixer. Bottom Line: A tropical getaway of a mixer. 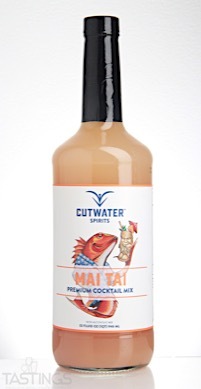 Cutwater Spirits Mai Tai Mix rating was calculated by tastings.com to be 89 points out of 100 on 5/31/2017. Please note that MSRP may have changed since the date of our review.